A profession gone with time. 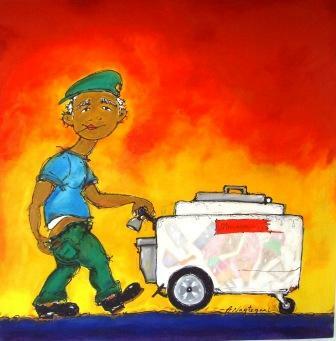 In the past, portugues labourer used to earn their living walking around selling icecream products in these unique portable containers. (vreezers). 'Bogi bogi', 'tempi', 'hi go go' and 'eiskrim sandwidge' arn't easy to find anymore.